From watching movies on our cozy bed to working with a laptop on the coffee table, our internet based activities have really become easier with Wi-Fi. We love being connected to this wireless internet connection to enjoy working on the move. However, now a new technology has emerged and is preparing to beat the Wi-Fi and that’s Li-Fi. This new technology promises improved internet connectivity and speed, along with reduced internet traffic congestion. Li-Fi (Light Fidelity) transmits data at extremely high speeds using off-the-shelf LED light bulbs. Wi-Fi uses antennas and radios but this new technology is going to use light around us to offer the same functionality. Li-Fi was invented in 2011 by physicist Harald Haas, a Professor of Mobile Communications, School of Engineering / Institute of Digital Communications (IDCOM) at University of Edinburgh and Chief Technical Officer (CTO). TIME Magazine in 2011 had listed Li-Fi among the 50 best inventions. Li-Fi uses light instead of radio waves and the spectrum of the former is 10,000 times bigger than the latter. Wi-Fi networks are getting more and more congested over time for which internet performance is definitely going to suffer. However, using a completely different spectrum could be a great solution which the Li-Fi promises to offer. Potentially, Li-Fi is quite energy efficient. Its infrastructure is quite simple and connecting to it might be as simple as turning on a lamp. 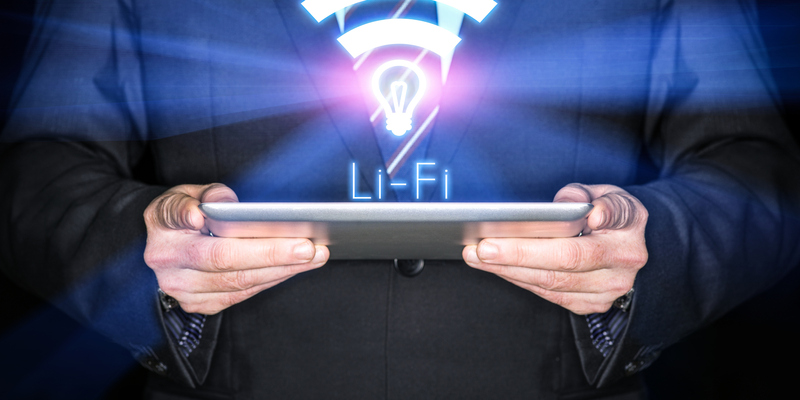 With Li-Fi connectivity, data rates of 10 Gb/s could be reached whereas Wi-Fi offers a maximum rate of 7 Gb/s. Using lasers, the speed could also reach beyond 100 Gb/s. With such high speed, one can download an HD movie in seconds. Li-Fi is also cost efficient. As compared to radio technology, it requires fewer components and is thus cheaper than Wi-Fi. It is also believed that the mass production of lasers would lower their cost, moving them to lighting applications. As the signal of Li-Fi is carried by optical light, it cannot penetrate walls, which strengthens the security of local networks. However, this also poses an issue, as it suggests that if a user moves out of the room, he will lose the connection. For the successful implementation of Li-Fi, this major hurdle has to be overcome. Another interesting fact is that Li-Fi never interferes with radio signals. It works on the technology of Visible Light Communication (VLC) and comes into action within nanoseconds by switching on LED bulbs. Li-Fi indeed promises some appreciable benefits which Wi-Fi fails to offer. However, it is yet to be seen how successful the implementation of this new technology turns out to be.